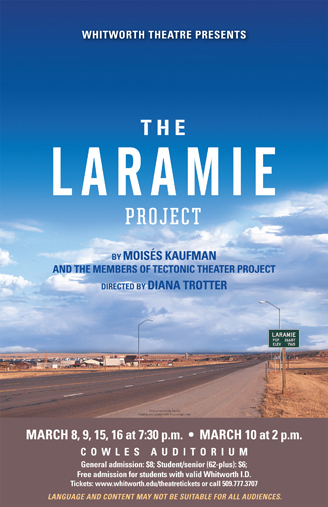 This year the Whitworth Theatre Department’s spring production is the docudrama “The Laramie Project.” Performances will take place March 8, 9, 15, and 16 at 7:30 p.m. and March 10 at 2 p.m. at Cowles Auditorium. Admission is free to Whitworth students with valid I.D. Tickets are $8, and $6 for senior citizens (age 62+). Tickets can be purchased online at www.whitworth.edu/theatretickets. “Theatre can provide a safe space to talk about things that might otherwise be hard to talk about, or give us perspectives that we haven’t thought of, or just help us consider our beliefs in new ways,” says Diana Trotter, theatre professor and director of “The Laramie Project” at Whitworth. The play is a unique and challenging docudrama in which each actor must play a variety of roles. The script is composed of actual interviews, court transcripts and media reports, which are delivered verbatim, giving authenticity to the voices of the characters in the story. Because of the subject matter and the play’s adherence to actual events, “The Laramie Project” is not suitable for children. It contains profanity that may be considered offensive by some. Judy Shepard, the mother of Matthew Shepard, was a guest speaker at Whitworth in fall 2011, speaking on “The Message of Matthew.” She and her husband founded the Matthew Shepard Foundation, to honor the memory of their son. 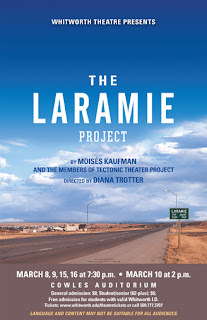 The television film version of “The Laramie Project” was awarded four Emmy nominations, The National Board of Review Award for Outstanding Made-for-Television Movie, and a Golden Bear Award, from the Berlin Film Festival.